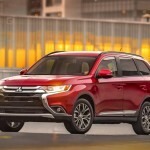 First Drive Review the 2016 Mitsubishi Outlander: Eclipsing the competition? When one begins talking about cars the word “Mitsubishi” rarely comes up. 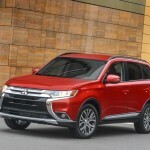 We talk about Ford, or Chevy, maybe Toyota, but Mitsubishi? No. I own a Mitsubishi. A Mitsubishi Eclipse, 2001 model. It was purchased a few years old, provided reliable transportation, was fun to drive, and was eventually handed down to our my, now 19. The Eclipse is perhaps the best known of the Mitsubishi line, yet is no longer available. 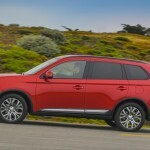 Today if you want a Mitsubishi, your choices are the Lancer, the new Mirage, the all-electric I-MiEV or the Outlander. 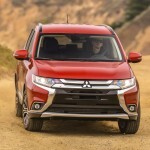 One of the problems perhaps is how forgettable the Mitsubishi name is when it comes to vehicles. The brand isn’t iconic, doesn’t have a rich history, and really has nothing to get anyone excited about. 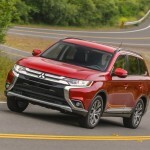 But I liked my little Eclipse, and I like all things automotive, so when delivered the new 2016 Outlander for a recent week, I was hoping for the best. The Outlander replaced the Montero Sport in the States in 2003. 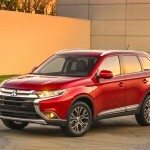 Now in its third generation, for 2016 Mitsubishi updated the exterior, with new front and rear fascias using a design concept Mitsubishi calls “Dynamic Shield”, a feature inherited from the bumper side protection seen on generations of the Montero. In all Mitsubishi says there have been over 100 engineering and design improvements for 2016. 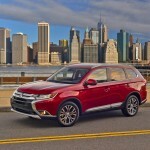 The Outlander is a seven-passenger crossover that competes with the likes of the Sorento, RAV4, Rogue and Escape. The Outlander comes in four different trim levels: ES, SE, SEL and GT. Standard options on the ES include 18-inch alloy wheels, cloth upholstery, a six-speaker 140-watt audio system, steering wheel audio controls, and Bluetooth. There are also other standard features such as LED running lights and taillights, heated mirrors, rear privacy glass, full power accessories, cruise control, automatic climate control, a tilt-and-telescoping leather-wrapped steering wheel, a height-adjustable driver seat, a 60/40-split folding second-row seat that slides and reclines, and a 50/50-split third-row seat. Moving up to the SE adds an upgraded audio system with a 6.1-inch touchscreen, keyless entry and ignition, foglights, body-color side mirrors with integrated turn signals, a trip computer, dual-zone automatic climate control, heated front seats and a rearview camera. My model for the week was the SEL. This trim level adds black roof rails, gloss-black interior trim, leather upholstery and a power driver seat. There are also options not available on the ES and SE. Fro example the SEL Premium package adds a sunroof, a power liftgate and a nine-speaker Rockford Fosgate audio system with satellite and HD radio. The SEL Advanced Safety package adds automatic headlights, automatic wipers, adaptive cruise control, lane-departure warning and a forward collision mitigation system with automatic braking. Both packages include power-folding side mirrors. Our tester for the week had all that along with the SEL Touring package that combines the other two packages and adds an upgraded 7-inch touchscreen with a navigation system. The top of the line GT has all the SEL options standard with the exception of the touchscreen for the navigation system and the Advanced Safety package. You can add those with the GT Touring package. The GT also adds LED headlights, silver roof rails, chrome exterior beltline accents, shift paddles and an auto-dimming rearview mirror. Options for all trims include a rear-seat DVD entertainment system and remote start, while all except the ES are eligible for LED foglights and front and rear parking sensors. Under the hood there are two engines available. The ES, SE and SEL get a 2.4-liter four-cylinder engine that produces 166 horsepower and 162 pound-feet of torque. The 2.4 can only be mated to a continuously variable automatic transmission (CVT). ES models are front-wheel-drive only, while the SE and SEL can be had with either front- or all-wheel drive. Our SEL was the front wheel drive only. Move up to the GT and you will have a 3.0-liter V6 with 224 hp and 215 lb-ft of torque under the hood. A conventional six-speed automatic (with shift paddles) and all-wheel drive are standard. 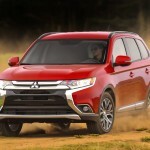 The Outlander Sport model is slightly smaller than the Outlander and has some design tweaks. It too has been updated for 2016, but oddly the base models have a smaller 4-cylider; 2.0-liter with 148 horses and 145 pounds of torque. You can upgrade to the 2.4 engine but you will still get the CVT. You also lose the third row seating. Inside the Outlander is small (since we have never tested the Sport we can only imagine an interior that is even smaller). The first impression was not overwhelming. We saw that while there is third row seating it is fitted into a space so small that it seems basically useless. The headrests for that third row are unceremoniously dumped in the back storage bin and need to be fitted manually. From the driver’s seat I felt large in the small cabin (although I am wide of girth am not tall of height). The view is fine, but on the road the power from the 2.4 liter fall a little short. In fact it made the drive during our week feel a little uninspired. The CVT seems to always be trying to catch up and while the power should be fine for everyday use, the confidence to pull out and pass on the highway is a bit lacking. Also, with only the two wheel drive model and the lack of power the last thought we had was doing anything off road. With all the available safety features we also wondered why there was no blind spot monitoring or warning. The lane departure feature worked fine but is always on meaning that you must turn it off each time you start up, a little annoying that. At the end of my week I was a little disappointed. 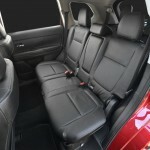 Sure the Outlander looks great and the inside is well made with quality materials. However, with so much competition it’s a shame that Mitsubishi hasn’t done just a little bit more. 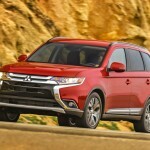 Mitsubishi likes to say that the Outlander and Outlander Sport are their best selling vehicles. However, that may not be something to shout about. 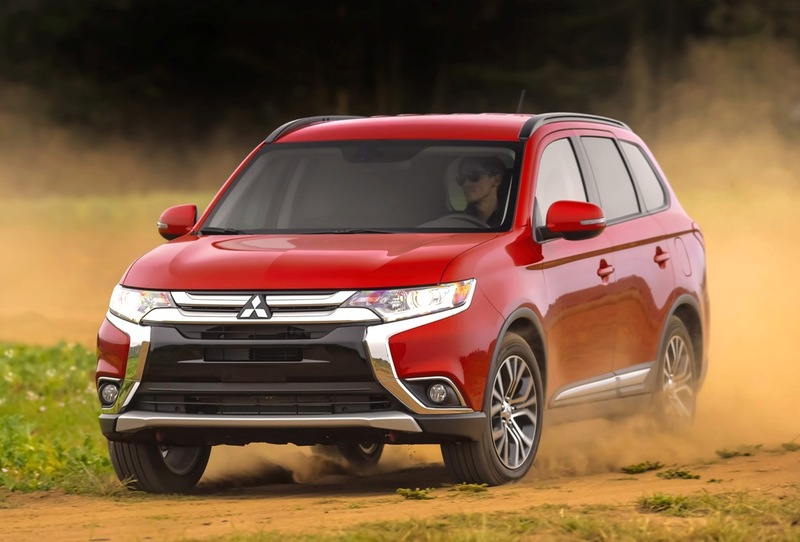 The Outlander Sport ranks 140 while the Outlander ranks 143 in vehicle sales so far in 2016. Their competitors are all well inside the top 50 save the Sorento which is 51. The RAV4 leads the pack at number 8, followed by the CR-V (11), the Escape (12) and the Rogue (13). 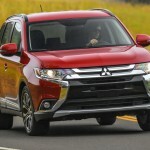 Perhaps the new redesign will catch fire with consumers and there no doubt loyal Mitsubishi drivers who will go nowhere else. Also had we tried the GT with a bit more power under the hood, maybe we would have liked the Outlander a little more. 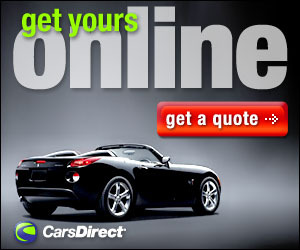 Yes there is a great warranty program (10 year/100,000 powertrain, 5-year/60,000-mile new vehicle; 7-year/100,000 mile anti-corrosion/perforation limited warranty; and 5-year/unlimited-mileage roadside assistance program), but at the end of the day for a crossover SUV that comes in at just over $30,000 MSRP, we want a little more. A bit more power, something that will inspire us to actually want to drive the Outlander. Maybe in the future we will get just that, until then we will still like driving our son’s 2001 Eclipse and know that Mitsubishi can do so much better.